Born in Harriston, Ontario, he moved to Winnipeg at an early age. It was with the Winnipeg Victorias, first as a player then as an executive, that his hockey fever caught fire and he performed exceptionally well in both capacities. The Victorias won both the Stanley Cup and Allan Cup during his association with them. 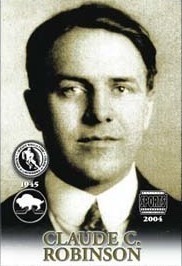 Robinson first suggested the formation of a National Association to compete for amateur hockey championships and he became the first secretary of the Canadian Amateur Hockey Association when it was formed in 1914. Claude Robinson managed the Canadian Olympic Hockey Team at the 1932 Winter Olympics at Lake Placid, New York. He was later named a Life Member of the CAHA.